I've had this account for a while but just started the times gesture practice, this is my first set. Been doing a lot of figure studies trying to improve my proportions. Any feedback is welcome thank you!! Have this account for a while but it's the first time posting here.. Some gestures from this week (90 secs) Cheers guys! More one min poses from today. Hopefully I can make this a daily thing, need to get better Any advice is appreciated. Have a nice day! I like the flow in these! Last edited by Ruben Silva; November 22nd, 2018 at 03:42 PM. how do i improve im pretty bad..
@deathtitties; You're not bad. You're practicing, which is better than not practicing, so that is good. As for your studies, you might benefit by doing stick figures first then filling in the rest of the body. I see a lot of incomplete figures, and I think that if you had started with stick figures first, you might have finished a lot more full figures. Yeah man, I'm doing it everyday and I feel like I'm improving each day. Also check the newmastersacademy channel on youtube and watch Steve Huston and Glenn Vilppu doing it, it might help. Cheers. Hey, I just found this forum today, and this is my first time using the quickposes tool! Excited to start practicing more and improving. 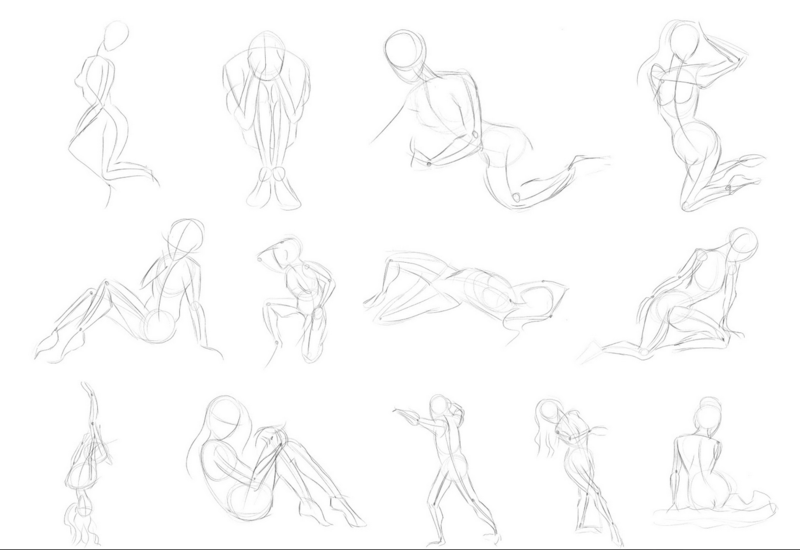 I did 15 one minute poses just now. Can I have some advice / criticism? I want to be more consistent with my shapes but I feel my lines getting sloppier as I go, as my hand starts to ache after just a few minutes of drawing. Any help is appreciated! 2 minute timed gesture drawings. (Full View Here) I would love some feedback. impressive work and nice flow! have you been drawing for a long time? The official what's your favorite thread...thread!